Patanjali, the spiritual guide, a rare genius, a great name in Indian Scriptural lore and a great Sage, author of Yogasutras, lived in a period, which is still in a mystery like other mysteries of India. An author on yoga - the Science of Sciences and a yogi, who contributed his experience to the yoga-philosophy. It is believed, he was an incarnation of Adi Shesha, and was a divine or legendary personality who left behind a legacy to the next generation. His yoga is known as Rajayoga and Patanjalayoga leading to liberation. Samadhipada, sadhanapada, vibhutipada and kaivalyapada form the four sections of this Mnemonic Rules. Patanjali incorporated the needed necessities in a slender treatise. Everything necessary for the thorough understanding of the subject has been provided by him in a skeleton form. Dr. Chandra S. Naikar (b. 1952) was the Professor and Head of the Department of Sanskrit, Prakrit and Yoga Studies, Karnatak College, Dharwad. Now he is in the P.G. Deptt. of Studies in Sanskrit University Dharwad. He has several research publications to his credit in Sanskrit, Kannada and English. He has been closely associated with a number of academic associations besides being associated himself with the field of drama as Writer, Director and Producer of Sanskrit and Kannada Radio T.V. plays. A few of his Sanskrit plays have been published in Samskrita Pratibha, and a monograph on Shadaksharadeva was published by the Sahitya Akademi. He has attended many International Conferences. Sarasvati Vikas Canada - Ontario has awarded Ramakrishna Sanskrit Award for 1997 to him for his contribution to Sanskrit language and literature. 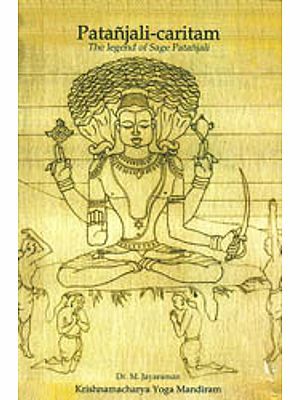 This monograph is designed to provide the students of literature and the general reader of yogic and philosophic literature with a brief introduction to Patanjali of Yogasutras, a spiritual guide and a mighty sage in India's Scriptural lore. His influence on later yogic preceptors and philosophers has been remarkable and unique as well. His rare genius, is in a way incomparable. 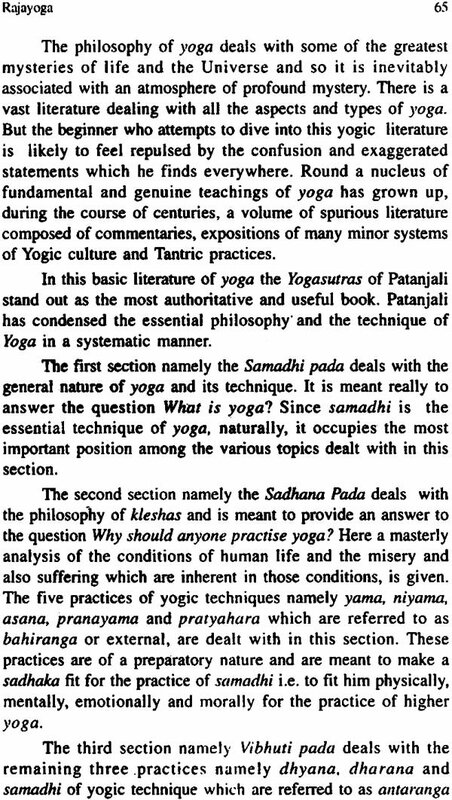 A short account of Patanjali's life and work is provided here through a series of his sutras in English translation illustrating the important aspects of yogic observances. An analytical list of the sutras has been attempted. An estimate of Patanjali's great contribution to the classical and esoteric literature has been provided. Original Sanskrit sutras in transliteration to the classical and esoteric literature have been provided. Original Sanskrit sutras in transliteration, wherever necessary have been offered alongwith their English renderings. 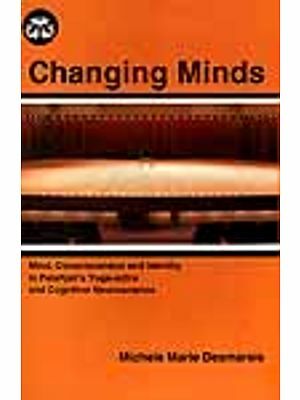 Rajayoga and Patanjali as a yogi form as the crux of this study. A short bibliography and a key to pronunciation have been provided at the end to help further reading. Roman transliteration of the sutras cited in this monograph from the last part of the work, i.e. Appendix. I remain ever grateful to the esteemed Sahitya Akademi for giving me this opportunity of writing on one of the remarkable classical writers. I am thankful to Ms. Jaya Dandavatimath Professor of German, Karnatak College for her help in understanding the text in German. My sincere thanks are due to Dr. R. C. Hiremath (Former Vice Chancellor, Karnatak University, Dharwad), Dr. C. R. Yaravintelimath, Prof. of English, Dr. Mallikarjun Paraddi, Prof. of Sanskrit, Karnatak University for their timely help in this undertaking.